Guess who's coming to Kanye West's concert?! 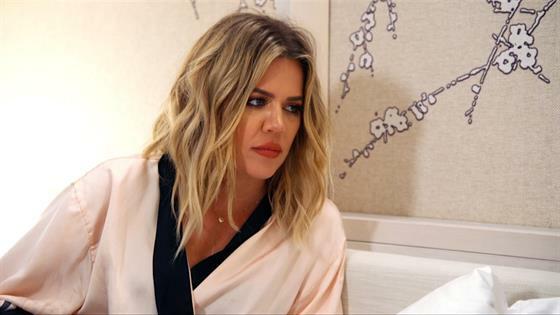 Season 13 of Keeping Up With the Kardashians kicked off on Sunday night with lots of buzz about Khloe Kardashian's romance with NBA baller Tristan Thompson. While the sisters and their friends visited Miami for Yeezy's Saint Pablo tour stop, Kim Kardashian was on a mission to get as much juicy details about her sister's new relationship as possible after paparazzi photos surfaced from her recent getaway to Mexico. "So, I see pictures of Khloe with some NBA player, and even though I know not to believe everything on the internet, Khloe and a NBA player do go hand in hand," Kim said. "It's my sister. Of course, I want to know who she's hooking up with." Unfortunately, Khloe wasn't quite ready to immediately spill the beans or oblige Kim's thirst for information. "Kim's my sister. I'm obviously going to tell her eventually," Khloe said. "But it's fun to torture her. She's tortured me my entire life, so I feel like this is the perfect time to drag this out as long as I possibly can." After days of dodging and evading questions, Khloe finally put Kim out of her misery and surprised everyone by bringing Tristan to the concert for an introduction! Kim was obviously satisfied to be in the loop on Khloe's love life. "I knew she was messing with me, but I'm just happy that she's having a good time and starting a new relationship," she said. "He's a little young, but I'm excited to tell Jonathan and like a couple of my friends!" Meanwhile, Kourtney Kardashian and Scott Disick struggled to set boundaries within their co-parenting relationship. "I really do enjoy hanging out with Scott with the kids because we know what we're doing, but if we're doing things socially, I just don't know how to act," Kourtney explained. She later became frustrated when she couldn't even spend time alone with her pals at Kim's assistant's birthday celebration. "Sometimes I just need a break from Scott," Kourtney vented. "I just think I need to prioritize myself and be able to go to my friend's birthday dinner and enjoy the night without him being there." Scott decided to confront the awkward situation head-on to figure out the best solution with Kourtney going forward. "I guess we both do need to do our thing without us being together," he said. "I feel like maybe there's times you want to run around with all your girlfriends, probably don't want you ex-boyfriend to be there. I get it. If I'm hitting the strip, I probably don't want you rolling." "I'm happy that Scott is bringing this up," Kourtney said. "Communicating is something that we're clearly not the best at together. I just think it's going to be a constant process of figuring out how to live life parenting our kids and still being a family but not being together." Elsewhere, the sisters had to make a big decision about the fate of their DASH locations after a major department store offered to purchase the clothing boutiques. "It's such a smart idea because it will give us a chance to finally evolve and move on," Kim said. "We've had this store for a decade." But even though Kim and Khloe wanted to sell, Kourtney wasn't prepared to close that chapter just yet. Instead, she wanted to step up the merchandising and devote more effort. "I just really think that our stores are more than just a business," she argued to Kim. "I feel like it's sentimental. After dad passed away, having DASH really gave us something to do together as sisters. We should definitely keep our stores 100 percent." After much debate, they agreed with Kourtney in the end. They ultimately decided to ditch the New York location, but keep Los Angeles and Miami since they had built the brand together from the ground up. Kris Jenner was extremely proud of her daughters' decision to hold off. "It's really your roots and how you guys got started in fashion," she said. "That was some of the best years of our lives, guys." Katch up on the best episode moments with the recap video above!